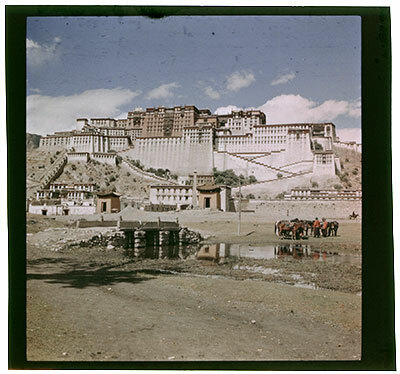 The Potala from the south with the Zhol settlement at its base. The Zhol pillar can clearly be seen.There is a stone bridge in the foreground and there are two men with horses on the right of the image. The Tibet Album. "Potala from south east" 05 Dec. 2006. The Pitt Rivers Museum. <http://tibet.prm.ox.ac.uk/photo_2001.59.8.67.1.html>.